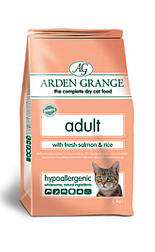 Arden Grange Fresh Salmon & Potato Grain Free is a complete food for adult cats. It will provide a complete and balanced diet with ideal levels of all the nutrients your cat needs to ensure optimum health and vitality. The food is naturally hypoallergenic and suitable for cats with more sensitive digestion or skin and senior cats. This is due to the premium quality ingredients used and high ethical standards that Arden Grange live by. The key ingredient in the food is the highest quality salmon. Salmon is highly palatable, easily digested and naturally packed with nutrients. Fish oil is rich in Omega 3 which is excellent for your cat's skin and coat, as well as helping to reduce reactions to food. The food will also promote a healthy urinary tract with added cranberry. Ideal for all adult cat breeds with a normal activity level and those that could benefit from extra support for their skin and coat. It is important to remember however that these figures are guidelines only, your cat's activity level, temperament and metabolism need to be considered. 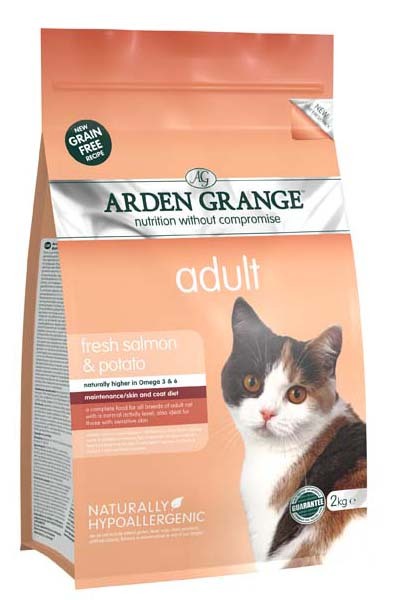 There are currently no questions for Arden Grange Fresh Salmon & Potato Grain Free Adult Cat Food - be the first to ask one!